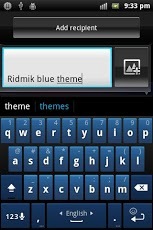 Ridmik Keyboard is a free(No Ads) keyboard for writing Bangla in android devices. Bangla phonetic keyboard, fixed layout keyboard, lots of smilies, word prediction/suggestion, learn as you type feature, you get all for free when you choose to install this keyboard in your smart phone. NOTE: Please remember that your device needs to have native Bangla support to write Bangla smoothly. IT'S NOT THE RESPONSIBILITY OF THE KEYBOARD IF YOUR PHONE CAN'T RENDER BANGLA. So, please don't rate poor unless it's the fault of the keyboard. Oh, I forgot! you can still hope to write Bangla if your phone doesn’t support Bangla. go tohttp://hasnath.net/ridmik-keyboard#noBanglaSupport for more detailed information. 6. Learn words as you type feature, It will learn new words from your typing predict from them afterwards. 13. Facebook status update directly from the app. 14. Need an 14th feature? Fine, Just send an email & let me try my best. Internet: for facebook status update right from the app.